Yahoo Messenger is one of the highly popular and most widely used instant messaging service in the world offering a wide variety of features to it’s users, all for free. This has made it the right choice for all those who are waiting to chat and communicate with their far away friends and relatives. For example, you may chat with Person-A using one name and withPerson-B using the other. You can also chat with the same person using different names or any other combination. All of this goes really unnoticed by the user on the other side, while you are sure to have some real fun. Sign in to your Yahoo Messenger. From the top, click on Messenger-> My Account Info. You will be taken to a web page where you need to log in to your account. 3. From the Aliases page, click on: “Add an alias”. You can create as many aliases you want. Choose unique names for your alias and once you’re done, click on “close”. 4. You need to sign out of Yahoo Messenger and sign in again to see the changes. 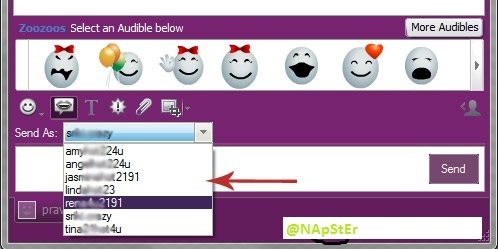 Once you have done this, double-click on any name from your contact list or chat room to open a new chat window. You should now see a list of your aliases appearing in the chat window to choose from. Just wait a few seconds! When the person replies to both your pings, you will have two tabs in the same chat window from where you can chat with the same person using two different names. Note:- Before you try this hack, make sure that you have not set any display image for your profile. If not, there are chances of other person identifying your prank.